Yays It's been a while! Special thanks go to Danalm, asa01 and Kalico at Animepaper's Session Zero. This wall was born because I hate how there were only a couple of (and bad) scans dressed as queen (or king? ), so I changed her clothes myself and gave her appropiate scenery. Hope you guys like it. 16:9 is the full version. 4:3 version includes half window, half swords. 5:4 version doesn't have window. There is no full body vector, in case anyone wonders about it. Eye-less is mysterious and cool. I'll probably submit it anyways if someone wants. Wowwww, amazing wall! Great job! The lack of a face isn't a problem. This is "THE" Saber wallpaper. She can be my queen anytime. OMG! So nice <3 Love it! 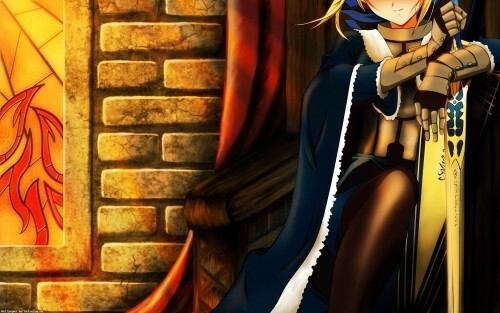 I also thought there were to little pictures/wallies of Saber as King/Queen. That's an awsome wallpaper. Thanks. Amazing! Gorgeous! thnk you for this wallie! is Great!